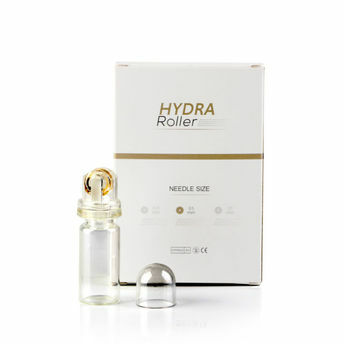 Titanium Dermaroller Microneedle Automatic Hydra Derma Roller helps to stimulate collagen production and to increase the absorption of skincare products.When rolling a traditional derma roller on the skin, you often need to apply an essence or serum with the other hand which is surely not convenient. Therefore, Elmask brings unique derma roller with bottle successfully combines microneedles with the essence liquid in the bottle and imports it automatically into the skin, thereby inducing skin collagen regeneration naturally through physical stimulation. The micro needles in this product are much smaller than that of a dermatologist so rest assured, these won't hurt. Benefits: Do not share your Derma Roller with anyone else and do not use on irritated or infected skin, fungal skin, active acne, rosacea, eczema, and etc. Be careful when rolling around the eyes. Do not use on the eyelids or lips. Keep the derma roller away from possible sources of contamination. Important: Recommended for use under dermatologist supervision for visibly smoother, tighter skin. If there is any blood on the derma roller, soak it in warm water with a little washing up liquid added until clean. Be sure to rinse well with water. Sterilize your derma roller by standing it in disinfecting alcohol for at least 20 minutes. After cleaning/sterilizing, place the derma roller on a clean towel until it is dry. Once dry, replace the needle cap and store the roller in a clean place. Whenever possible, try not to let the derma roller's needles come into contact with any hard surface (doing so will make them blunt more quickly). Explore the entire range of Dermarollers available on Nykaa. Shop more Elmask products here.You can browse through the complete world of Elmask Dermarollers .